I imagine I’ll get laughed off the slopes if I went out like this. So today is our two year wedding anniversary. I have the best wife in the world! 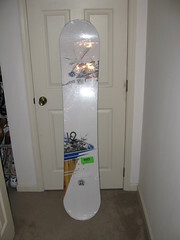 Natalie got me a K2 snowboard for our anniversary, how cool is that? I guess that really means I need to get us a trip to Colorado booked in January!! !